If Hollywood Sci-Fi movies make you jump from you seats and be in awe of the hero using gizmos that are seemily out of this world, here is something that is as good as the mind blowing technology that you see on screen but this time it is for real. Now an Indian has invented, which from the looks of it has the potential of being a true technological breakthrough and enable people to carry their Sixth Sense with them. 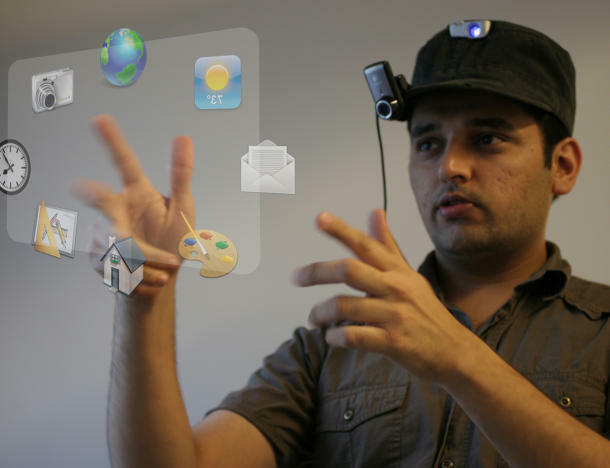 The project named Sixth Sense is the brain child of Pranav Mistry, a 28-year-old research assistant at the Massachusetts Institute of Technology’s Media Lab. The demo was shown first during the TED conference in California in February 09. The crowd were super awed by his technological breakthrough, which actually cost no more than 350 dollars. This time around, during TED India conference at Mysore, Pranav Mistry was back with more details into the product and further announcements regarding the Sixth Sense technology. If you did see the complete video the reactions could well have been “mind blowing”, “exciting”, “un-believable” etc. I had to watch it more than twice to come to terms that the augmented reality demoed is for real. The concept is amazing and if the inventors are to be believed, the device which is made using off the shelf components would cost around 350$ . What’s more, this time, Instead of selling the technology to a big techno giant like Apple or Microsoft, Mr.Pranav Mistry wants to make it Open Source – And that has increased the value of this awesome product way beyond anything I have seen in recent times. “I notice that it’s hard to for these kind of things to market in some sense. . . because I don’t want this to comply with some of kind of corporate policy,” he told PTI in Mysore on Friday on the sidelines of TED conference being held in India for the first time. I am not sure what he means by “hard to market”. This thing sure has huge potential even though it may not be a mass-market product. But then, making it open source will see many more innovations and developments which could go a long way in making Sixth Sense a true information enabler as i see it. It’s a shame though that the brain child of an Indian techie may not hold much water in the India. The pre-requisite for the devise is the all important “Mobile Internet”.Â We all know the woos India is going through with this 3G business which is so imperative for a good Mobile Internet use. The internet in your mobile phone is what powers this device to pull the relevant information. With Indian Internet Infrastructure still very much nascent, I do not see a lot of contribution from the Indian Open Source community even when the project is Open Sourced. There is no doubting the technological prowess of the Indian minds , hell the project is a baby of an Indian IIT graduate , it is the lack of right infrastructure that is a deterrent here. We have the brains and if we can do it sitting in an MIT lab, what would stop us from doing it in India. But, the reality is that we are so many light years away from providing the much needed infrastructure for the world class technological breakthroughs to emerge out of India. So, instead of blaming the intellectual folks for choosing foreign shores, the focus should be on providing a world class platform for creative ideas to flourish and see the light of the day. What are your thoughts on the Sixth Sense technology and its far reaching potential? Does it have the where with all’s to become a mass market product. yep this is worth an look..